...at Mulberry Door by nawwTy's Kitchen with their signature "luxe comfort food". And you won't miss the distinctive and weathered wooden door of the restaurant. Inside Mulberry Door by nawwTy's Kitchen, one feels immediately at home with its book-laden wooden shelves for that rustic yet elegant vibe capped by chandeliers and the comforting warmth of wood-toned furnishings. Just like Trish Panlilio herself, one can't help but feel her vibrant personality at Mulberry Door by nawwTy's Kitchen, exuding elegance with subdued and tastefully understated grace and style. In fact, dining at Mulberry Door by nawwTy's Kitchen is, I imagine, probably just like dining in Trish Panlilio's home with that casual and laid-back yet refined style. It's this intangible element that also defines her culinary philosophy, elevating home-cooked comfort food to a level all her own. That's luxe comfort food for you. It's what made nawwTy's Kitchen a successful catering business, and you can experience it all here at Mulberry Door by nawwTy's Kitchen (for more on nawwTy's Kitchen, see my earlier posts, Luxe Comfort Food by nawwTy's Kitchen on some of her popular dishes, A Tasty and Flavorful Preview of The Gourmand Market from four years ago when I first experienced her elegant spin on comfort food and Let's Feast! Starting The Year Right With The Return Of The Gourmand Market featuring her signature Crab Fat Paella topped with pork cracklings and Paella Negra). And this Valentine's, Trish Panlilio infuses her own personal touch to comforting favorites with Mulberry Door by nawwTy's Kitchen's special set menus. The comfortingly familiar becomes refreshingly new and exciting with inspired touches that uplift the dish for a memorable dining experience at Mulberry Door by nawwTy's Kitchen. Take the starters of the Valentine's Set Menu as the perfect example, each one a very good choice. Diners can opt for the soup or salad, with the hearty and soothing Carrot Soup with Crisp Pancetta that's perfect for the cool February weather. The subtle sweetness of the carrots deliver a homestyle richness that coats the palate with each sip, perfectly contrasting with the pancetta for both flavor and texture. Resembling the warm colors of the usual pumpkin soup, Mulberry Door's Carrot Soup offers distinct and deep flavors that warms the palate and body with just enough grainy texture from the carrots for a satisfying starter. It just isn't Trish Panlilio's style to serve you the usual Caesar Salad. That just won't do. Have the Caesar Salad with Poached Egg and Caviar instead. That's luxe comfort food. Gently break the poached egg and let it ooze down the crisp garden greens for rich layers of flavors, a richness tempered by the vibrant briny notes of the caviar and smoky bacon. The poached egg and caviar makes all the difference, transforming the usual salad into something even more special. It's the little touches, those indulgent and elegant tweaks that clearly elevate Trish Panlilio's comfort food. For the mains, diners and couples can choose from three elegantly plated dishes, including this Prawn Risotto with Mushrooms for that perfect blend of nutty and earthy notes from the mushrooms paired with the fresh and briny sweetness from the succulent prawns. Masterfully executed, the risotto is moist infused with the rich flavors of mushrooms. The grilled prawns complete this dish, adding yet another layer of flavor. ...for the Ribeye with Bearnaise & Whipped Mashed Potatoes, my personal choice. Perfectly grilled to medium rare with a juicy pink center, this one's a winner. Served with Bearnaise Sauce for that added punch, but this ribeye is really good on its own. Tender with a savory beefy richness, the slab of premium ribeye is elegantly carved and sliced garnished with buttered vegetables and topped with fresh micro greens. The last entree option was a pleasant surprise. The Pan-Seared Miso Glazed Sea Bass with Couscous is a simple yet flavorful dish with fresh and clean notes. The delicate sweetness of the sea bass is enhanced even more by the subtle salty notes of the miso glaze for balanced flavors. For me, if it was a choice between a juicy ribeye and a seafood course, I'd go for the beef in a heartbeat. But one bite of the sea bass made me think twice, and I'll probably go for this one. Prawn Risotto with Mushrooms, Ribeye with Bearnaise & Whipped Mashed Potatoes and Pan-Seared Miso-Glazed Sea Bass with Couscous, each one an excellent choice for Valentine's. 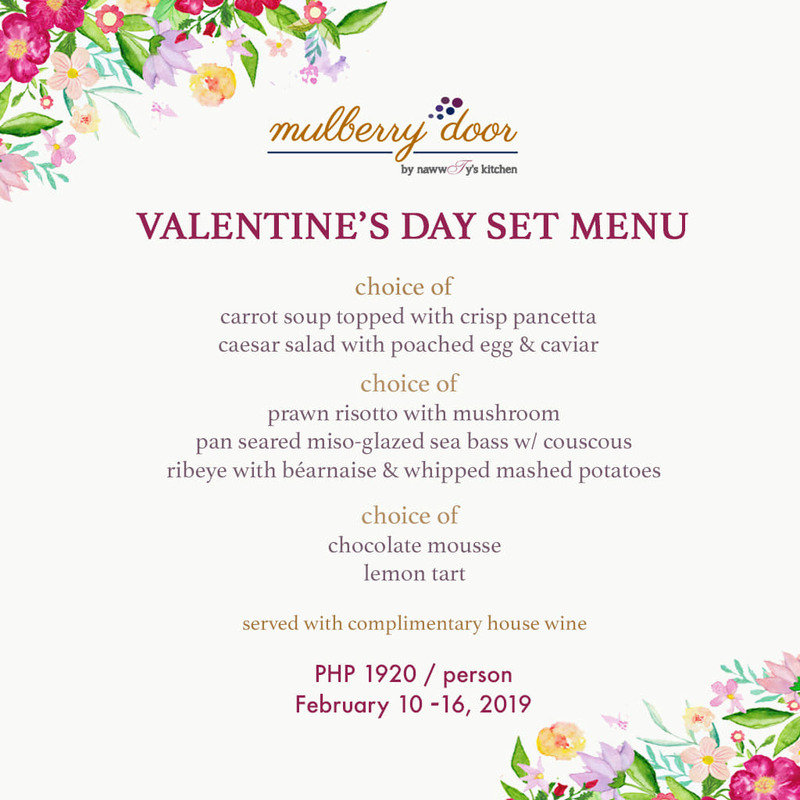 The special Valentine's Day Set Menu at Mulberry Door by nawwTy's Kitchen includes complimentary house wine to complete the mood and help seal the deal. For dessert, the velvety smooth and decadent Chocolate Mousse topped with fresh strawberry caps your intimate Valentine's feast. if you prefer your dessert with a bold citrus finish, the Lemon Tart should do the trick. Mulberry Door by nawwTy's Kitchen is located at 8 Forbestown Road, Burgos Circle, Bonifacio Global City, Taguig City or call 810-5427 or +63918-998-7474 for inquiries and reservations. You can also check out their FB Page at https://www.facebook.com/MulberryDoor/. Noodles and Dumplings...Back at Paradise Dynasty. The Table's Set and Ready...at Mama Lou's.